The following notes are a basic interpretation of some salient points in the Countryside and Rights of Way (CROW) Act 2000. These notes convey the spirit of our Freedom to Roam set out in legislation, granting us the right to visit designated areas known as Access Land. More reading about the CROW Act can be found here. We can wander the routes set out in Owens Walks without fear of trespass, all our walks are on existing Rights of Way i.e. public footpaths, Concessionary Paths and Access Land. Countryside and Rights of Way Act 2000: The CROW Act has finally opened up vast areas of Lancashire Uplands and Moorlands unaccessible during my earlier years. 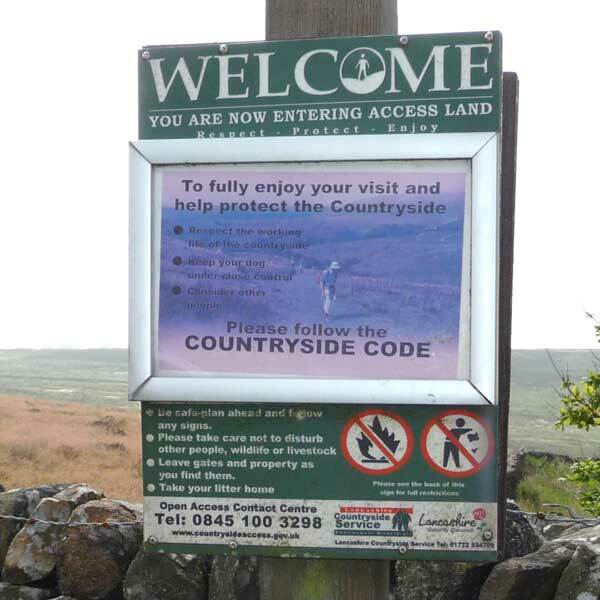 Much upland area in the Forest of Bowland is open for access for walkers and wildlife watchers. In May 2005, the CROW Act 2000 introduced a new right for people to walk on areas of open countryside and registered common land. Permitted activities: include walking (and running), sight-seeing, bird & wildlife watching, picnicing & climbing. NB. Horse riding, camping & cycling (& certain other activities) is not allowed, these activities must keep to existing rights of way. Since 2004, Access Land is clearly marked on Ordnance Survey Explorer maps (1:25000), this is the map series I recommend for walking because it contains sufiicient detail for route finding. The CROW access areas are shaded yellow with a brown (orange) border, an example of the key used on Explorer maps can be found here. Signs on the ground: Information signs have been developed & should be available at main access points. Access Restrictions: The CROW Act 2000 allows landowners and agricultural tenants to close land or restrict access in certain circumstances. Land owners have a vested interest to maintain access to ensure they continue to receive the generous European subsidy payments. NB. Expect changes here due to BREXIT! Forest of Bowland guide: A comprehensive guide to the Forest of Bowland Access Land can be found here.